There seems to be a commonplace understanding that अनुस्वार is an option for writing the अनुनासिक-s. It is difficult to say, whether this commonplace understanding is correct or not from the standpoint of grammar. ययि = in the presence of (i.e. when followed by) वर्ण-s of प्रत्याहार यय् (= वर्ण-s in 8 शिवसूत्र-s from 5 to 12). Note, this excludes वर्ण-s in शिवसूत्र-s 13 and 14. पदान्तस्य। = अनुस्वार at the end of a पद. This means that a stand-alone word or a sentence or line of a verse should not end with अनुस्वार. These should end only with the अनुनासिक. It was also mentioned there that when to write अनुस्वार and how to pronounce it are points, which merit specific discussion. In all the examples अङ्ग / अंग, सञ्जय / संजय, पण्डित / पंडित, अनन्त / अनंत, चम्पा / चंपा whether to write अनुनासिक or अनुस्वार seems to be more the WRITING option, not necessarily a rule for pronunciation. We can assume that these words will be pronounced only appropriately, even if written either way. Nevertheless, the pronunciation of अनुस्वार in इमाँल्लोकान् would have a slightly different accent than of न् of इमान्. So, there is a contention that अनुस्वार is not just a writing option for writing the अनुनासिक-s, but connotes a different accent also. The following सूत्रम् is the rule for अनुनासिक म् to be अनुस्वार. Of course, “conditions apply”. The applicable condition is हलि परतः when म्-कार is followed by a consonant. The logic or application of the rule can be extended to derive a corollary, that म्-कार at the end of a sentence or at the end of a line of poetry should not be written as अनुस्वार. At the end of a sentence or at the end of a line of poetry, there is nothing after the म्-कार, so, no परवर्ण् at all. So, म्-कार should remain म्-कार ! we have (स्-अ म् स् क् ऋ त् अ). May it be written as सम्स्कृत or as संस्कृत ? Would these have different pronunciation ? Does it then appeal that the अनुनासिक म् be better written as अनुस्वार ? That suggests that one should understand the rule about when an अनुनासिक is better written as अनुस्वार. In some texts one may find the अनुस्वार written as ँ्. So संस्कृत could as well be written as स ँ्स्कृत. One can deliberate on some interesting nuances. It may again be noted that, whether it is written as यथा नदीनां बहवोऽम्बुवेगाः or यथा नदीनाम्बहवोऽम्बुवेगाः the difference would be primarily in writing. It makes no difference in pronunciation. For a finer observation, the म् of बहवोऽम्बुवेगाः cannot be written as बहवोंबुवेगाः even if it would get pronounced as such only. It cannot be written as बहवोंबुवेगाः, because, it will then miss the अवग्रह-symbol ऽ, which is essential here ! of अनुनासिक at the end of a line in a poem. म् of कलेवरम् needs to be म् only. न् of त्यजत्यन्ते could as well be written as त्यजत्यंते ! Rules about अनुस्वार are part of rules of treatment of अनुनासिक-s or of संधि-s with अनुनासिक-s in पूर्ववर्ण-position. When a word ending with नकार is followed by (प्रत्याहार छव् =) छ्, ठ्, थ्, च्, ट्, त्, नकार is written by अनुस्वार. Also, सकार gets added before परवर्ण. A वर्ण coming in or getting added is called as आगम, rather as सुडागम (=सुट् + आगम). Note, सुट् stands for स् when स् gets added as an आगम. The अनुस्वार here may be found in some texts written as ँ्. So, सखी ँ्स्तथा, प्राणाँ्स्त्यक्त्वा, कामा ँ्स्तु. Having mentioned संस्कृत (सम् + कृत = सं + स् + कृत), I should also bring to notice two words संकर and संस्कार. Both have their derivation from सम् + कृ. But in संकर there is no आगम of स्. In संस्कार there is आगम of स्, same as in संस्कृत. Also संकर could as well be written as सङ्कर. Rather, it should better be written so. So, when a व्यञ्जन, except ह्, (Note, प्रत्याहार यर् does not include ह्) is followed by an अनुनासिक, then the व्यञ्जन becomes अनुनासिक of its own वर्ग. The letter वा makes it clear, that application of this rule is optional. In both these examples व्यन्जनम् in पूर्ववर्ण-position is कठोर. अनुनासिक in परवर्ण-position has मृदु characteristics. So by कठोर + मृदु, the कठोर पूर्ववर्ण् becomes मृदु by झलां जशोऽन्ते. 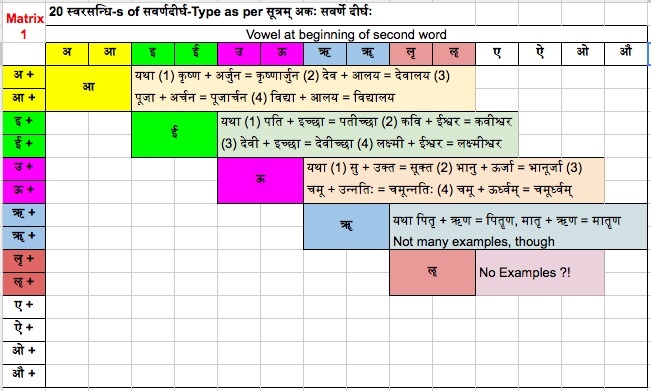 Examples – चिन्मयम् (चित् + मयम्, त् → न्), तन्मात्रम् (तत् + मात्रम्, त् → न्). Here मयम्, मात्रम् are प्रत्यय-s with अनुनासिक म् at the beginning. We have discussed अनुनासिक-संधि-s both when अनुनासिक is in पूर्ववर्ण-position or in परवर्ण-position. We have also discussed use of अनुस्वार, when writing. To proceed further with व्यञ्जनसंधि-s, Table 2 in the previous Lesson No. 26 is a good table to keep a track of how we proceed. Case 5 discussed in Lesson 26 was, for example the case of खर् + खर्, i.e. both पूर्ववर्ण and परवर्ण being खर्. But as was mentioned, there are special cases. Case 6 – स्तोः श्चुना श्चुः। (८/४/४०). The explanation is – सकार-तवर्गयोः शकारचवर्गाभ्यां योगे शकारचवर्गौ आदेशौ भवतः। Since this explanatory statement is in Sanskrit, I guess, it would help to explain it in English. Hence, when पूर्ववर्ण-letters are स् or any letter from त्-वर्ग, and are followed by (i.e. परवर्ण is letter from) श्-वर्ग (प्रत्याहार शर् – श्, ष्, स्) and च्-वर्ग (च् छ् ज् झ् ञ्) respectively, then the पूर्ववर्ण-letters are substituted by letters of श्-वर्ग and च्-वर्ग respectively. Note, as per Case (4) discussed in the previous lesson, it should have been स्याद्+जनार्दन So there is a dilemma here, whether to make the संधि as स्याद्जनार्दन or स्याज्जनार्दन. For resolving such dilemmas, there is a diktat विप्रतिषेधे परं कार्यम् (विप्रतिषेधे = in the event of a dilemma परं = the latter कार्यम् = to be done, followed, applied.) In Case 4 the सूत्रक्रमाङ्क was 8’2’39. Here in Case 6 the सूत्रक्रमाङ्क is 8’4’40. Obviously 8’4’40 is much later / latter. Hence this latter one has to be applied. So स्यात् + जनार्दन = स्याज्जनार्दन. It is to be noted that ज्ञ is ज् + ञ. So ज्ञ has ज् at its beginning. It is also to be noted that in the dictionary words starting with ज्ञ will be found in the alphabetical order of words starting with ज्. In north India, people seem to be pronouncing ज्ञ as ग्य. But ज्ञ does not have ग् at its beginning. श् of परवर्ण also is replaced by छ् ! There are two words ष्टुना ष्टुः But since this सूत्रम् (८/४/४१) is in continuation of the earlier सूत्रम् (८/४/४०), we carry forward the word स्तोः from there. This process of carrying forward is called as अनुवृत्ति. By this it becomes three words in this सूत्रम् also. So the सूत्रम् completed with अनुवृत्ति becomes स्तोः ष्टुना ष्टुः. Let us now do विभक्ति-वचन analysis for all the three words. Meaning, when सकार comes in contact with ष् or टु (ie ट्-वर्ग) letters, षकार is substituted in the place of सकार and when तवर्ग letters comes in contact with ष् or टु (ie ट्-वर्ग letters , ट वर्ग letters are substituted in the place of त वर्ग letters respectively. This is sort of further special case, applicable when पूर्ववर्ण-letters are of त्-वर्ग (त् थ् द् ध् न्), and are followed by ल्. In such instances पूर्ववर्ण-letters of त्-वर्ग are substituted by ल्. अनुस्वार, when to write it and how to pronounce it are points, which merit specific discussion. We shall come to it separately later. Case 9 – Looking back at the Table having seen in Case (5) that खर् + खर् (कठोर + कठोर) produces primarily a संयुक्ताक्षरम् (even in the special cases), natural curiosity will be about the result of यश् + यश् (मृदु + मृदु). The most common result here also is primarily a संयुक्ताक्षरम् ! For example in the word नैतत्त्वय्युपपद्यते (गीता 2-3), य् + य् + उ = य्यु. Actually य्यु in this word नैतत्त्वय्युपपद्यते merits some detailing. What is to be noted is that त् of एतत् and next “त् and व” of त्वयि become संयुक्ताक्षरम् त् + त् + व = त्त्व. This is case 5. Further in सन्धि of त्वयि + उपपद्यते, the वर्ण्-s involved are त् + व, य् + इ + उ from उपपद्यते. As per rule of स्वरसन्धि, य् + इ + उ becomes य् + य् + उ. After that य् + य् + उ becomes य्यु. This is case 9. Important point to be noted is that when studying व्यञ्जनसंधि-s, actually when studying any संधि for that matter, the consideration is to understand the phonetics, the resultant sound, when two वर्ण-s come together. It should be also noted that वर्ण is not always अक्षर. One अक्षर can have many वर्ण्-s as was shown in कार्त्स्न्यम्. In many words such as सर्व, कार्य, शल्य, माल्य, दिव्य, पूर्व, ब्रह्म, वह्नि, the वर्ण-s in पूर्ववर्ण position are य् व् र् ल् ह्. The resultants are all संयुक्ताक्षर-s.
Before going over to next case, it may be noted that Case 4 झलां जशोऽन्ते (८/२/३९) suggests that a harsh consonant, in the presence of (i.e. when followed by) a soft consonant becomes soft ! Case 10 – A soft consonant (प्रत्याहार यश्) becomes harsh in the presence of (i.e. when followed by) a harsh consonant (प्रत्याहार खर्) ! Example given in प्रभुपादव्याकरणम् is सुहृद् + सताम् = सुहृत्सताम् Note द् + स becomes त् + स. When झय् letters (first four letters of any वर्ग) are followed by हकार, ह् is optionally replaced by पूर्वसवर्ण (a letter similar to the preceding letter). पूर्वसवर्ण will always be the fourth letter of the same वर्ग, to which the preceding झय् letter belongs. Because application of the rule is optional, both the results are acceptable. When पूर्ववर्ण-s of प्रत्याहार झल् are followed by परवर्ण-s of प्रत्याहार खर् the पूर्ववर्ण-s change to corresponding वर्ण-s of प्रत्याहार चर् (च् ट् त् क् प् श् ष् स्). the word is derived from धातुः युध् with suffix सु. Here पूर्ववर्ण् ध् is from प्रत्याहार झल्. The परवर्ण् स् of प्रत्यय सु is from प्रत्याहार खर्. basically the मृदुव्यञ्जनं changes to कठोर/कर्कश-व्यञ्जनं of its own वर्ग. Finally we have युयुध् + सु = युयुत्सु. This is an internal संधि, happening in the formation of the word when affixing a suffix, as has been mentioned as एकपदे in संहितैकपदे नित्या. With a plan to discuss topic of अनुस्वार separately, above 12 cases substantially cover important types of व्यञ्जनसंधि-s for Simple Sanskrit. In व्यञ्जनसंधि-s पूर्ववर्ण is certainly a व्यञ्जनम् a consonant. परवर्ण may be a vowel or a consonant. Basically, whether a संधि is a स्वरसंधि or विसर्गसंधि or व्यञ्जनसंधि is decided by the feature of the पूर्ववर्ण, whether पूर्ववर्ण is a स्वर, स्वर + विसर्ग, or व्यञ्जनम् . So, in the case of व्यञ्जनसंधि-s, possible number of परवर्ण-s can be 33 व्यञ्जनानि and 14 स्वर-s. So the number of possible one-to-one combinations of व्यञ्जनसंधि-s can be as many as (33 व्यञ्जनानि as पूर्ववर्ण-s) x 46 (33 व्यञ्जनानि and 13 स्वर-s as परवर्ण-s) = 1518 व्यञ्जनसंधि-s ! That is a large number, especially to explain by as many examples. Putting them into groups and patterns would help to reduce the variety. Let us start with the class व्यञ्जनम् + स्वरः. Recalling what we studied in the case of most स्वरसंधि-s, the resultant sound on mixing of पूर्ववर्ण and परवर्ण is a single resultant sound. For example अ + आ = आ, अ + उ = ओ, इ +ऊ = यू. Resultant sound being a single sound is called as एकादेश. पूर्ववर्ण position complete with that स्वर. So, it becomes एकादेश. All the above संधि-s are so very natural, that there is not much of any प्रक्रिया to be explained. Some people would like to contend that these are not संधि-s at all. I would like to follow a simplistic concept that, whatever can be split into its components, should be considered as संधि. Actually there are many internal संधि-s, in view of the rule संहितैकपदे नित्या, नित्या धातूपसर्गयोः, नित्या समासे. Sanskrit word for sunrise is सूर्योदय which is a compound word, having two component words सूर्य and उदय. Because in a compound word it is compulsory to do संधि, नित्या समासे Hence सूर्य + उदय = सूर्योदय. Also उदय is itself उत् + अय, where उत् = up, अय = going, moving. So, by संहितैकपदे नित्या, नित्या धातूपसर्गयोः the word has to be उत् + अय = उदय = going up, moving up, rising. That is how सूर्योदय means sunrise. While above examples of संधि-s of “व्यञ्जनम् + स्वरः”-type, are simple or straightforward, there are interesting conditional variations. As said earlier, though number of possible व्यञ्जनसंधि-s can be as large as 1518 putting them into groups and patterns would help to reduce the variety. It becomes easy to understand the patterns by understanding the सूत्र-s of अष्टाध्यायी. Now, there is a set method of understanding a सूत्रम्. First we do पदच्छेद-s. To do पदच्छेद-s, we shall have to know all the संधि-rules. But we have so far studied only the स्वरसंधि-s and विसर्गसंधि-s, not the व्यञ्जनसंधि-s. So, for now, take the पदच्छेद-s, as I shall give. After पदच्छेद, we understand the विभक्ति-वचन of every word. नित्यम् is 0’0 because it is an indeclinable i.e. अव्यय. In the next step of understanding a सूत्रम्, it would be good to know that particular विभक्ति signifies a particular sense. The sixth विभक्ति denotes undergoing a change. The fifth विभक्ति denotes “when preceded by”. The seventh विभक्ति denotes “when followed by”. and when followed by अच् will suffer change as addition of ङम् always. 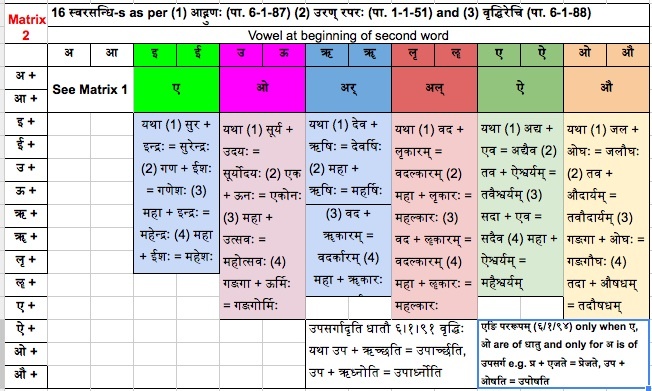 Here ङम् is a प्रत्याहार and denotes all वर्ण-s starting from ङ until म्. So ङम् denotes ङ्, ण् and न्. Also अच् is a प्रत्याहार denoting all वर्ण-s starting from अ until च्. This range from अ until च् covers all vowels. We can rewrite the meaning and understand that as per this सूत्रम्, ङ्, ण् and न्, when preceded by a short vowel and when followed by any vowel will always suffer addition of ङ्, ण् and न्. That means ङ्, ण् and न् will become doubled. Let us understand this by an example. प्रहसन् + इव = प्रहसन्निव. Here पूर्ववर्ण is अनुनासिक न्. It is preceded by short vowel ह्रस्वस्वर अ in स. Hence अनुनासिक न् has become doubled. The doubled न् mixes with इ and becomes न्नि. 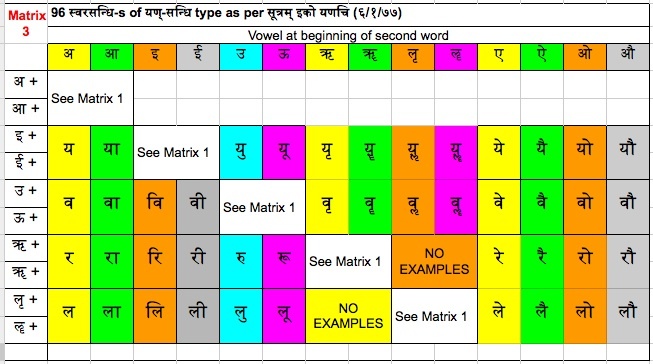 Note that in the examples of case (1), पूर्ववर्ण is अनुनासिक, mostly म् न्. This सूत्रम् does not provide for doubling of म्. But there is न् in some examples, which is not doubled. The reason is that the स्वर preceding the अनुनासिक न् is not ह्रस्व. For example, (a) दृष्टवान् + असि = दृष्टवानसि (there is आ before न्) (b) कुरून् + इति = कुरूनिति (there is ऊ before न्). In ईशावास्योपनिषत् the second mantra starts with the word कुर्वन्नेवेह. कुर्वन्नेव + इह = कुर्वन्नेवेह has अ + इ = ए (व + इ = वे) as per आद्गुणः (6’1’87) as studied in Lesson 21. Let us understand this सूत्रम् also, following the set method. जशः is 1’3 (प्रथमा विभक्ति बहुवचनम्) of जश् Note जश् starts at ज in शिवसूत्रम् (10) and covers all consonants until the end-marker श् of the same शिवसूत्रम् (10). Hence जश् means ज् ब् ग् ड् द् i.e. third consonant in च-वर्ग, प-वर्ग, क-वर्ग, ट-वर्ग and त-वर्ग respectively. The four च् छ् ज् झ् of च-वर्ग will change to ज्. That means ज् will not change. The four प् फ् ब् भ् of प-वर्ग will change to ब् That means ब् will not change. The four क् ख् ग् घ् of क-वर्ग will change to ग् That means ग् will not change. The four ट् ठ् ड् ढ् of ट-वर्ग will change to ड् That means ड् will not change. The four त् थ् द् ध् of त-वर्ग will change to द् That means द् will not change. The curiosity will then be what श् ष् स् of शिवसूत्रम् (13) and ह् of शिवसूत्रम् (14) will change to. We shall explore this later on. These changes influence संधि-प्रक्रिया-s also. Case (3) when झल् is followed by a vowel, the following vowel mixes into the जश्. So, with 24 पूर्ववर्ण-s from झल् and 13 vowels as परवर्ण-s, number of possible combinations can be 312. This सूत्रम् – झलां जशोऽन्ते (८/२/३९) becomes the formula for 312 सन्धि-s of Case (3). Actually, there is a सूत्रम् – झलां जश् झशि (8’4’53) has झलां and जश् common to झलां जशोऽन्ते (८/२/३९) We can say that झलां जश् झशि is an extension of झलां जशोऽन्ते. We shall discuss this in the next lesson.